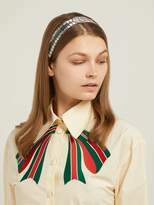 Gucci - This dazzling black and silver headband captures Gucci’s unfailing eye for the unexpected. 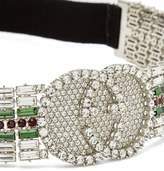 Designed with an elasticated grosgrain band at the back, it features rows of baguette-cut clear and green crystals spliced with a line of red round-cut crystals, which surrounds a large double-G logo. 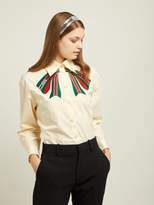 Wear it with a Web-striped blouse to embrace the house’s eccentric aesthetic.